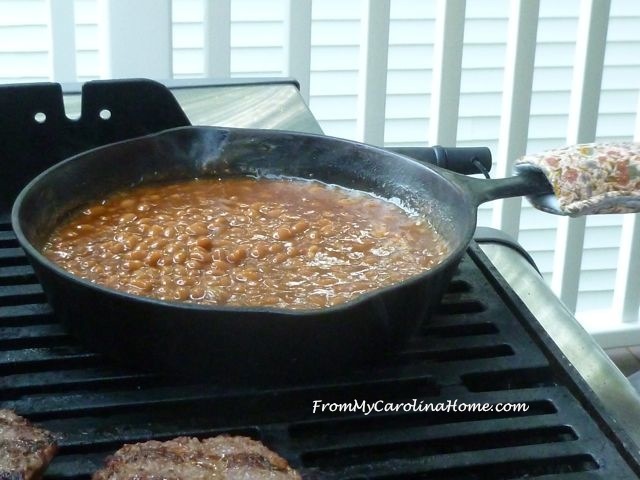 Labor Day usually means a cookout here, hot dogs with chili, bratwurst or burgers with beans. I actually made this quick project last summer, and then got busy. I am so easily distracted by shiny things and thrift stores. I realized that I never posted it, so here goes, just in time for the last cookouts through autumn. 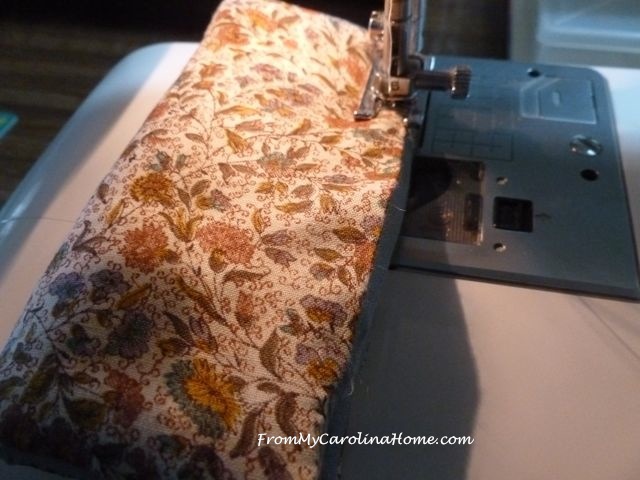 It is a simple idea, quick to make, and yet so very useful – a handle pad!! 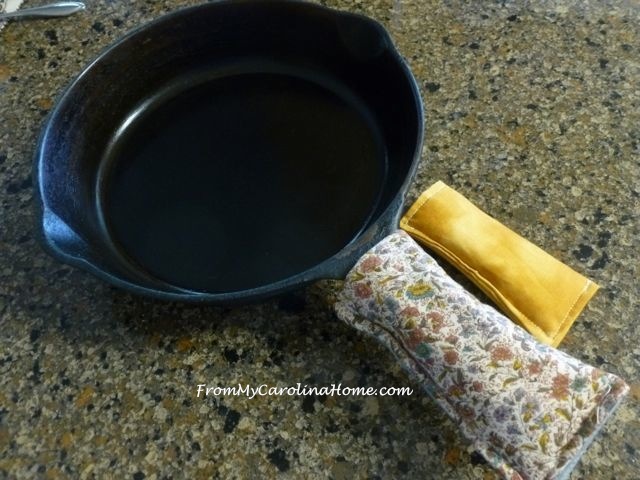 Since I have a glass top stove, I cannot use my cast iron on it. Using a cast iron skillet on the grill means the handle is too hot to pick up, but more important, when set on the tile table, you forget that the handle is hot. Having a pad on the handle keeps hands from burning, reminding you to be careful and that the pan is hot. This one is heat resistant enough so you can actually pick up the pan with it, not like some hot pads that don’t insulate enough. But, I usually have a hot pad in my other hand as the pan is heavy, especially full of food. 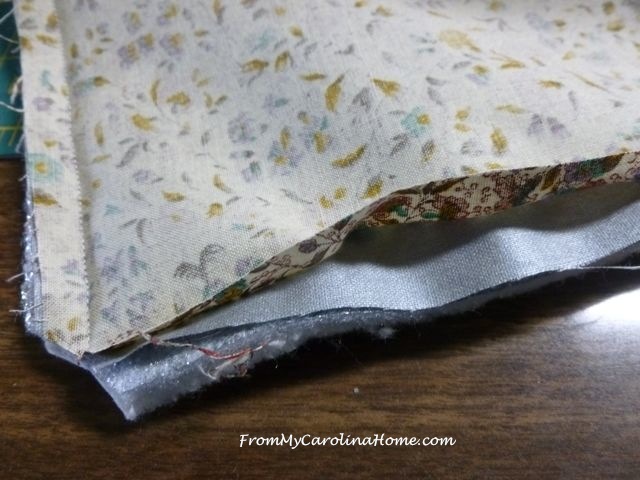 I experimented with the design and filling of the pads, and found the combination of heat resistant fabric, batting, Insul-Bright batting with a cotton cover worked the best for heat control. 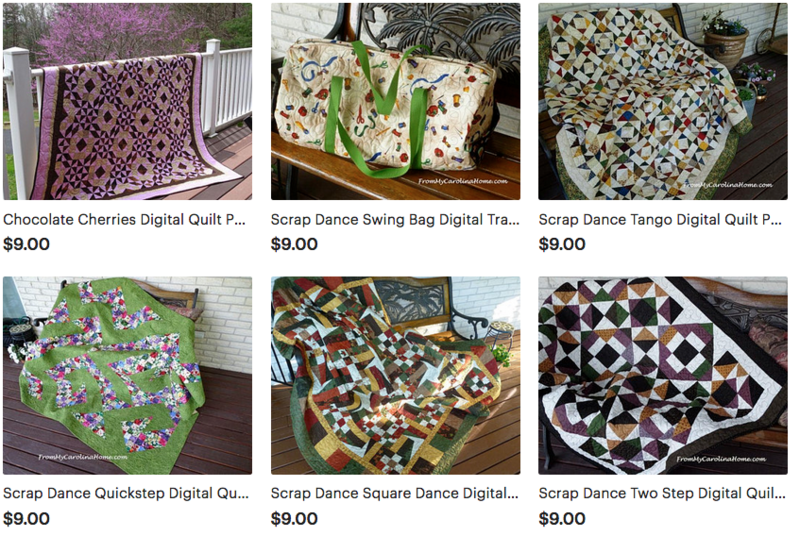 I had some scraps of heat resistant fabric left over from my project of Re-covering An Ironing Board but you can buy this by the yard at most fabric stores. Just 1/4 yard is more than enough for several handle pads. 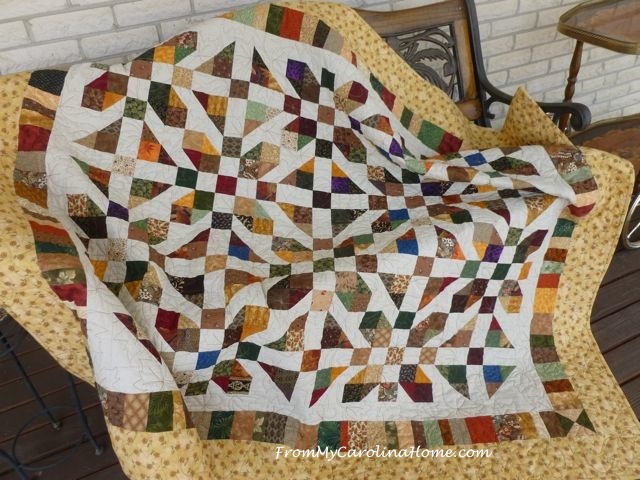 Cut your pieces 5-1/2 inches square. 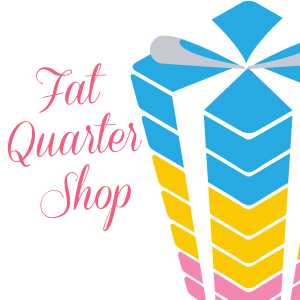 Note – I made the first one with a charm square and it was too small. That 1/2 inch makes a difference. 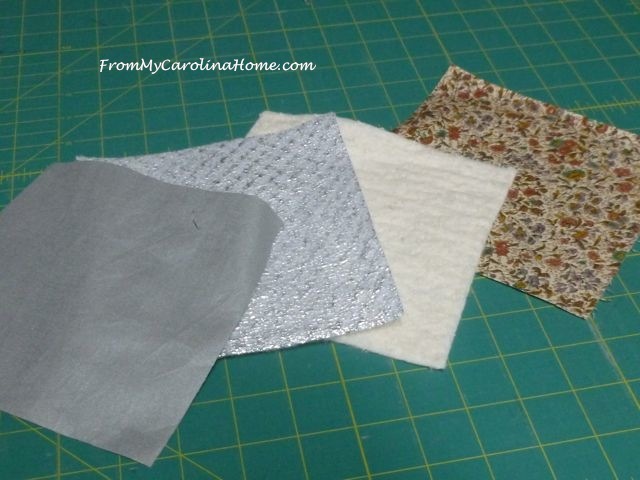 Arrange your layers like this, heat resistant fabric right sides together with your cotton fabric, Insul-Brite with the silver side facing the heat resistant fabric’s wrong side, and regular batting behind that. 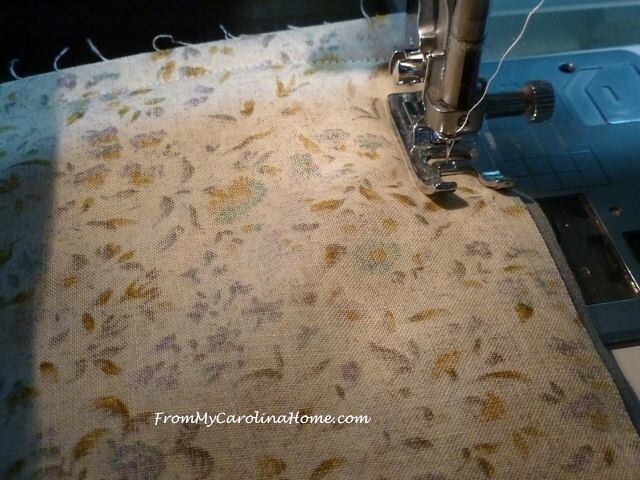 Sew through all layers, about 1/2-inch from the edge, leaving an opening for turning. 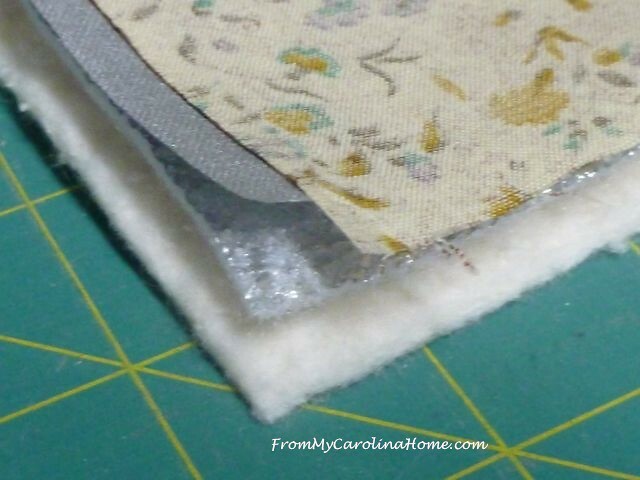 Clip the corners, and clip some of the fullness out of the seam allowances. Turn so the cotton fabric is right side out, with the heat resistant fabric on the other side. 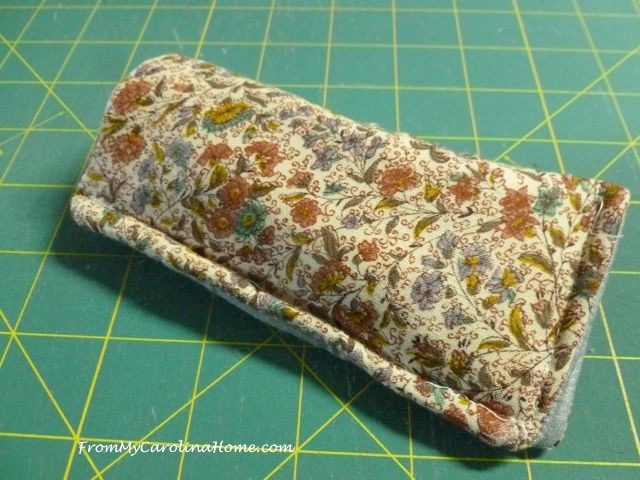 Fold in half, with the opening on the side, and topstitch down the side about 1/4 inch from the edge (closing the turning opening) and across the bottom. 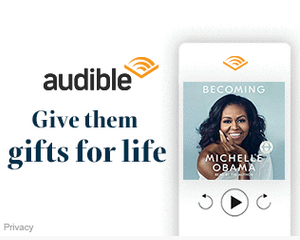 Easy, done in mere minutes. You can make smaller ones for smaller skillets, but this size will work for most. Just slide it onto the handle for lifting the skillet off the grill. Then leave it on the handle to prevent burning a hand while serving. I use it inside as well, when I start a meal by browning some chicken or pork then putting the skillet in the oven to finish. I like corn on the grill, but sometimes I don’t have fresh ears ready for a grilled meal. 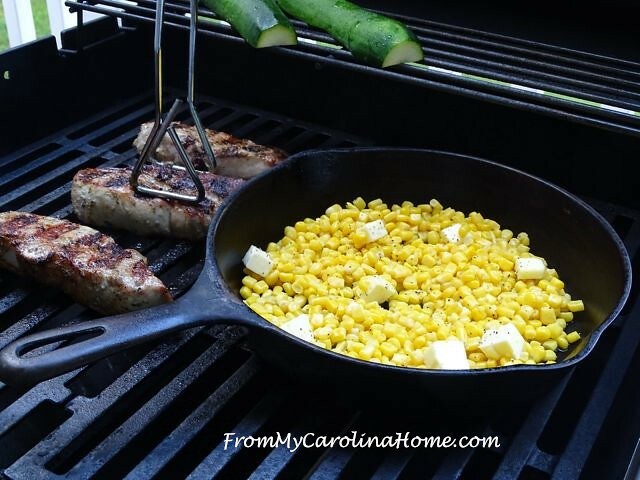 I’ll use canned corn with a few dots of butter and still get that lovely grilled corn flavor. Marvelous with grilled pork and some grilled zucchini. 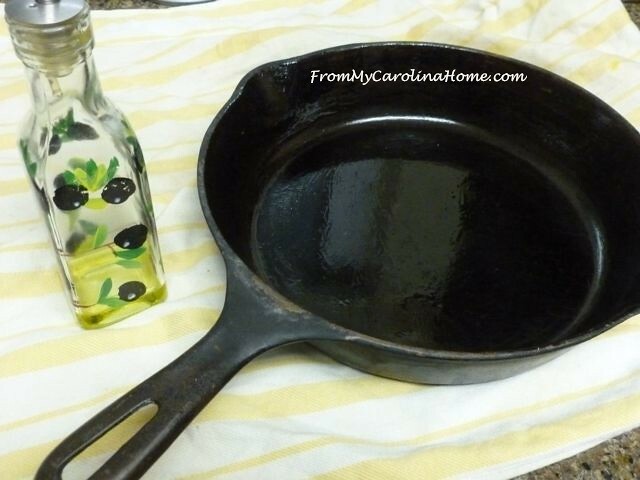 One note on cast iron, I season mine with olive oil after every use. I’ll clean the pan, then oil it so it doesn’t dry out. 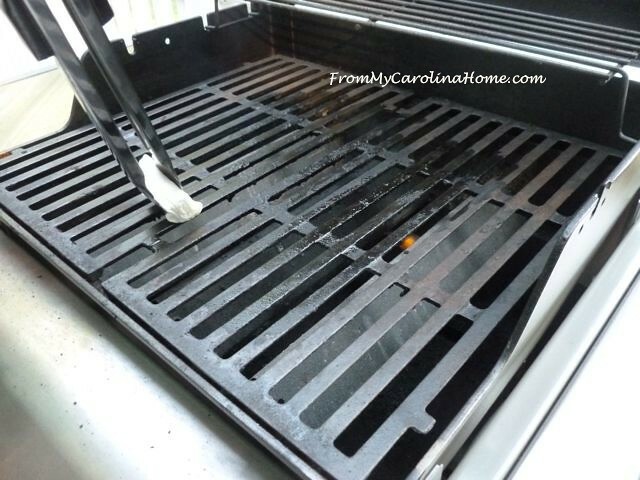 Another tip on grilling, heat your grill first, then use a paper towel soaked in canola oil to wipe the grates. Food won’t stick to the grates. Remember hot grate, cold oil, no stick. 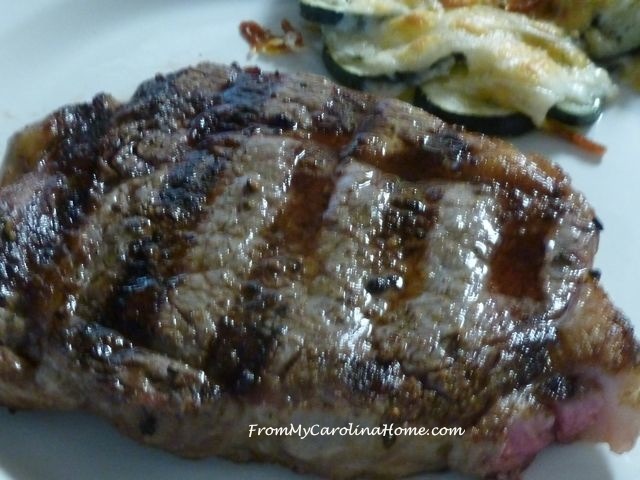 Your meats will have those wonderful grill marks like a great steakhouse restaurant. Yum!! 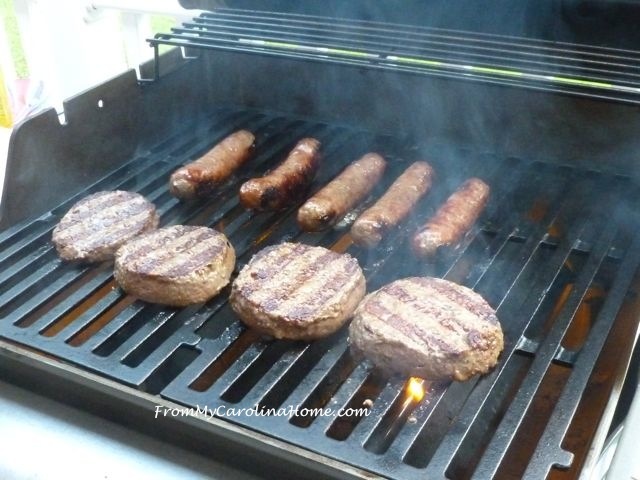 Burgers and bratwurst are great on the grill too. We like cooking out, can you tell? 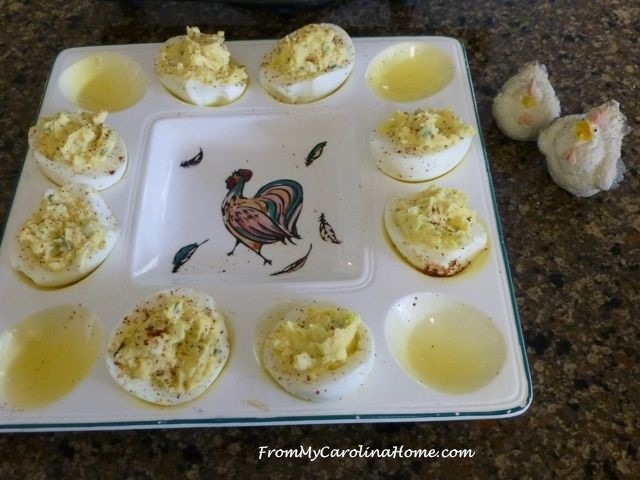 Picnics have to have some deviled eggs, right? Maybe try the last recipe you’ll ever need for Perfect Deviled Eggs. I have enough variations in that recipe to keep you interested for years. The handle pads would make a great guy gift for the man who likes to grill. Of course, picking a more guy-friendly print would be good. Pair it with a cast iron skillet, and my homemade seasoning mixes. The download for those recipes and more ideas for making Gifts for Guys is in my Craftsy store. Are you grilling for Labor Day? So easily distracted by shiny things and thrift stores….hmmmm???? Maybe YOU should be adding FLOOZIE to the title of your blog :~). 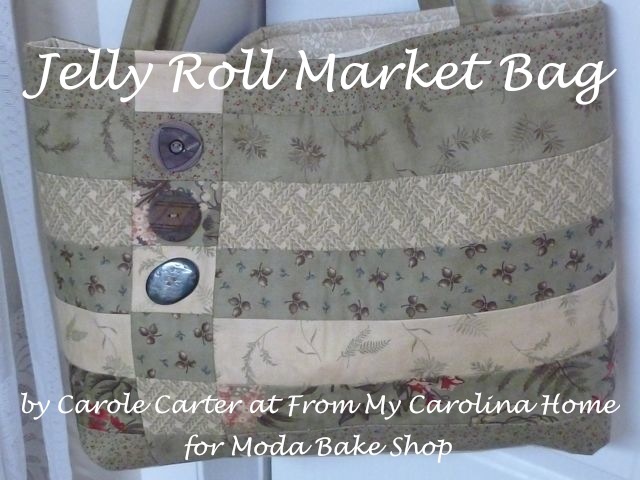 Love this one Carole… Will try it next. Thank you so much for the easy instructions for the handle pad. 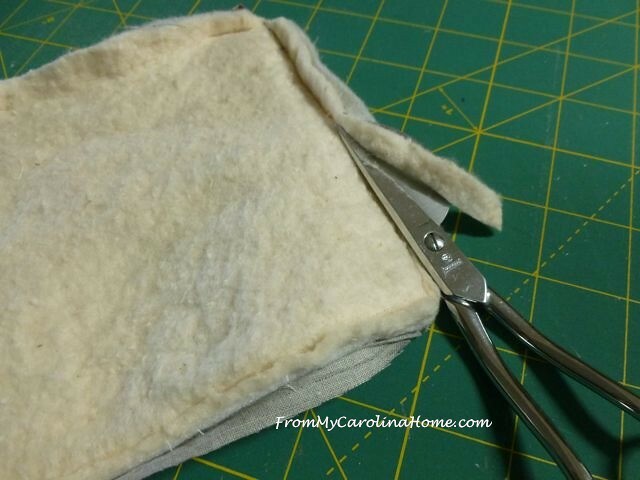 Handle pads….what a great idea and a good way to use fabric scraps. Hamburgers coming up! You can’t use cast iron on glass cook tops? Oh no! I love my iron pans but have a gas stove. I am definitely trying your corn idea as I don’t care much for canned corn! One of my favorite iron pan treats is the Rosemary rolls from the Pioneer Woman. You make those in the oven so you’d be safe trying them! Great idea! Those cast iron pans get pretty hot. Make them for him but I want touch that one, too much heat for me. 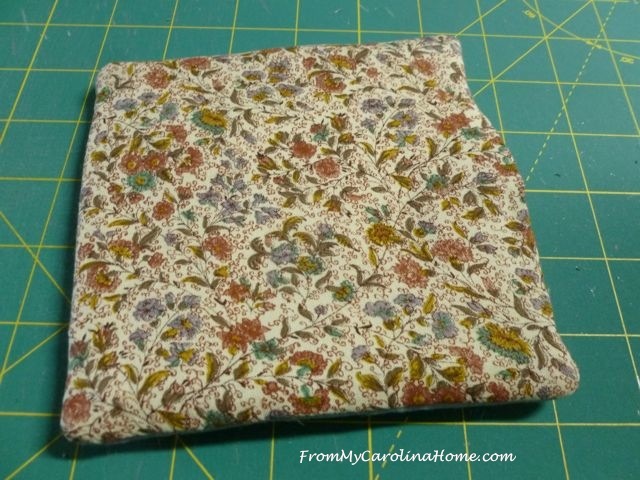 I’m going to make one of those cast iron handle pads for my mom, who does most of her cooking in her cast iron skillet these days. Thanks for the idea!!! Have a great weekend! Yes, we are having the block party at our house for Labor Day. We’ll grill dogs, burgers, brats, and chicken thighs. Weather is perfect today! Great detail – thanks for sharing. Jut work to catch up on here. If the weather cools a BBQ would be fun. 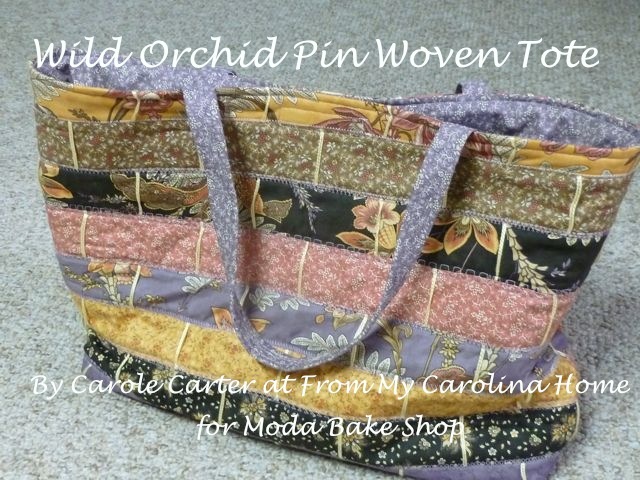 A wonderful idea, and quick and easy to sew. Great gift for anyone with a BBQ, or cast iron pans. Thank You for the handle tube tutorials Great idea. Like the sound of your barbeques. Most of the handles on my pans are not flat like your cast iron pan. Mine have a little arch to them. Will these still work for my pans? I don’t see why not, but yours may need to be a bit longer. Measure the handle from base to tip to be sure it has enough to cover the arch. I would imagine that your hand automatically rests in that arch. Thanks for asking! If only. My younger son ruined my grill and I haven’t bought another one. I should check for end of season sales and maybe get another one. Paul used to grill almost every meal, all year long. It’s so much nicer than having the cooking smells in the kitchen. And it tastes so good. I usually just grab the nearest towel / tea towel or my oven glove so this cover would be handy. I must get DH to try your tip to prevent food sticking on the grill. Such a good idea! 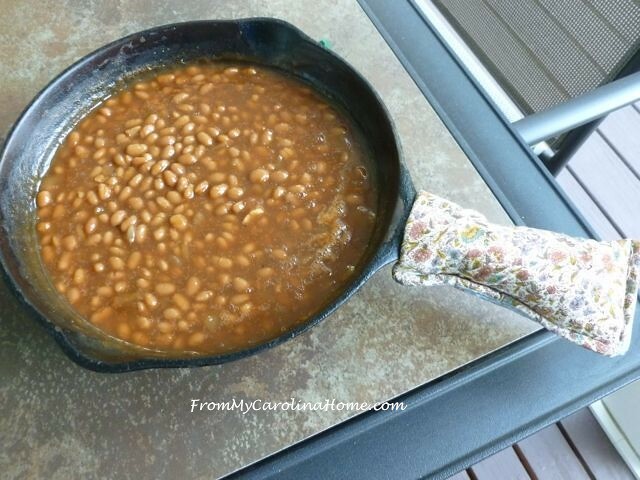 I had a great Corningware skillet with a metal bottom before I got my glass-top stove and had to give it away because I couldn’t use it with the new stove – it was great because you could start something on the burner on top of the stove and then put it right in the oven to finish it. Well, in what I can only think was temporary insanity, I reached into the oven one time and grabbed the handle to take it out without a potholder or oven mitt – I’ll never know why! Spent the rest of the evening with my hand in a towel full of ice, kicking myself….Anything that makes things safer is a good thing! Great idea! Thanks for sharing your process. I might have to make some of these for my sister’s camper. Her birthday is coming. 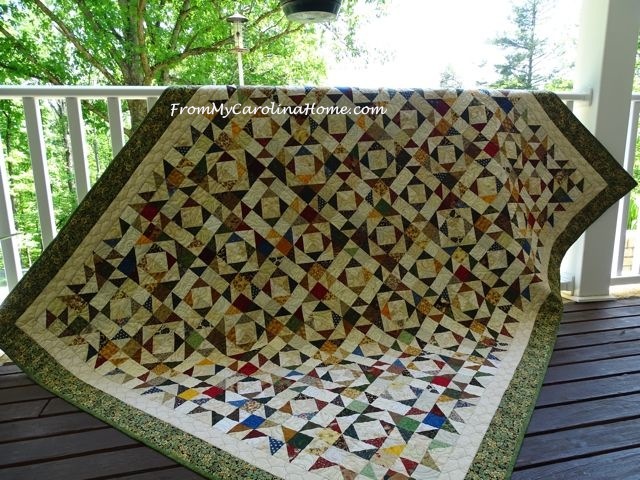 Thanks too for linking up with Oh Scrap! Pretty and practical……a great combination. visiting from cast iron Fridays… great project for the handle and oh so important! Right now I use my super thick grill mitts:) Your grill looks just like mine. Haven’t made a lot with my skillet but am planning on experimenting more both on the grill and in the oven.